Check out the Learn To Play Day website for details of what's happening near you. 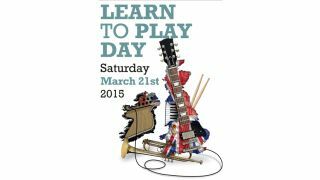 2015's Learn To Play Day, the annual event that's designed to get people playing musical instruments, will take place on Saturday 21 March next year, with organisers Music for All promising that it will be the biggest one yet. Set to take place at venues across the UK (with some also participating on Sunday 22 March), Learn To Play Day is designed for anyone who wants to start, or get back into, playing a musical instrument. 10,000 lessons are set to be delivered across the weekend, with fully qualified music teachers showing participants how to get started on a range of instruments including guitar, bass, drums, keyboards, violin, piano, trumpet, oboe, percussion and many more. There will be DJ mixing and singing lessons, too. The aim is to ensure that everyone taking part will have the opportunity to play something before they leave and afterwards. There will also be promotions to get money off buying equipment, and special offers on further music lessons. Jools Holland, Patron for the Music for All charity, commented, "Whether you used to play or whether you have always wanted to play... this is the day for you. I am delighted to help Music for All in their quest to inspire more people to participate in music making, either for the first time or to return to playing after having lapsed. I hope that my involvement will help the charity reach more people and get more people 'having a go'." Music for All expects various celebrities to take part on the day - full details of the event and all participating venues can be found on the Learn To Play Day website. Learn To Play Day is being run by Music For All in partnership with The Musicians' Union, the Take it away scheme, Rockschool, MusicRadar, instrument manufacturers, music shops and venues.